The PouchDB info () method is used to get the basic information about the database. The following example shows how to retrieve database information using the info() method. Let's take the database "First_Database" we have created in previous example. 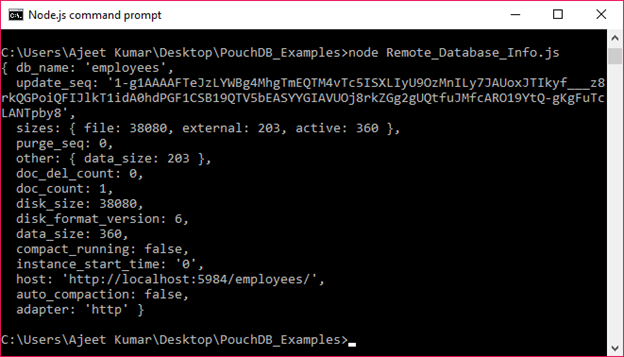 PouchDB facilitates you to get the information of a database that is located remotely on the server i.e. CouchDB. You just have to pass the path to the required database in CouchDB instead of database name. The following example will retrieve the information of a database that is saved in the CouchDB server. This code gives you information of a database named "employees".